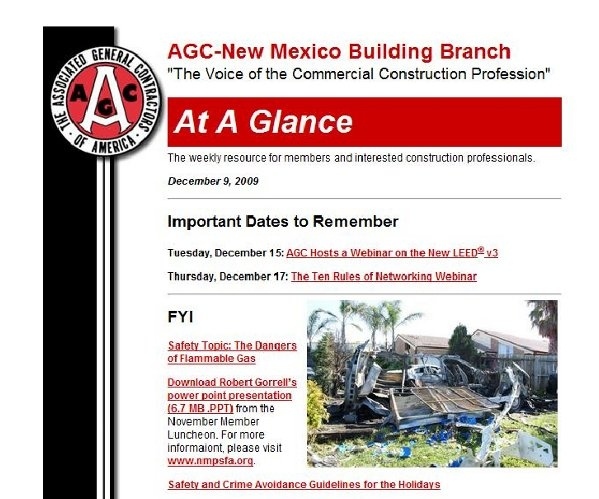 At a Glance is a bi-monthly electronic newsletter that serves as a timely resource for AGC members and interested construction professionals. At a Glance highlights upcoming events, workshops and other items that affect you and your business. We know your time is valuable and we aim to present you with succinct headlines that can be browsed quickly. Pertinent links are also included for event and class registration, news stories and other details as needed.